Art Fair Season is Nearly Here! This art fair season takes on a new meaning for me. Not only will I be venturing to see some fabulous artwork, but I am starting to brainstorm locations I would like to sell my jewelry in the future. Throughout the summer, I will do my best to keep you updated on upcoming art fairs. Because of my search for future sales locations, I will also be including table prices and application due dates. I hope to visit tons of art fairs this year! If you notice that I am missing an event on my list, please let me know! Run by Handmade Detroit, Craft Revival will feature 25+ local artists. Featured items include clothing, stationery, jewelry and more. Handmade Detroit knows how to do a great art fair! 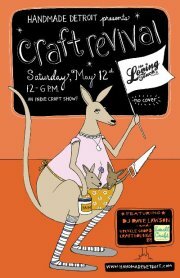 Detroit Urban Craft Fair is one of the coolest events in the area and I am stoked to see their downsized show. Enjoying some rad art with a drink in my hand sounds like the perfect evening. Vendor spaces cost $40, plus $10 nonrefundable application fee. Applications were due March 18. May 13 Royal Oak in Bloom @ Williams Street parking lot in front of city hall, 7a.m.-2p.m. This isn’t exactly an art fair, but it’s a beautiful event. 70+ vendors sell flowers, veggies, landscaping décor and other gardening goods. The parking lot is filled with smiling faces, puppy dog friends and everything for a summer’s worth of gardening. In their 49th annual art fair, ELAF will feature more than 200 artists, including fine art and crafts. Additionally, there will be live music, hands-on art activities and a variety of food options. Vendor space cost: $250-500. Applications were due January 31. More than 325 artists are featured in this park setting art fair. More than 60,000 people visit East Lansing during this art-filled weekend to enjoy the two art fairs. Two art fairs in one weekend, yep – I’m game! Vendor space is 10×10, $240 plus $20 nonrefundable application fee. Applications were due March 9. This is a fine art festival, featuring 175 juried artists. The park setting makes it a cute fair to visit. Items are usually in the higher price range, but it’s enjoyable to look at everything. My birthday is extra sweet this year! Two of my favorite art fairs will be held this day. More than 100 artists take up a four-block stretch of Downtown Berkley. I was fortunate enough to work at Yellow Door Art Market in the heart of this event last year. This is a great art fair with a nice variety of items. Vendor spaces are 10×10, $100. Applications were due April 1. This art fair draws 120+ national artists with an array of clay, glass and metal pieces. The Downtown Royal Oak area is a great place for an art fair. This particular fair is nice because it’s busy, but not overcrowded. This year, an estimated 20,000 people are expected to attend this event. Are you attending one of these art fairs? Am I missing any May or June art fairs? Leave me a comment!